Easter has arrived again, the Christian narrative of Jesus being arrested, crucified, dying and then ascending all occurs from Good Friday to Sunday morning, these few days are the foundation for the Christian religion. The Gospels account for this episode, giving us details which are rather unique and quite puzzling, or so to speak. In this article, I’m not going to try to offend anyone and I do apologize if I do, but as a Muslim, these questions are pertinent to the narrative given to these events by the Christian faith. We need to examine the foundation, for if the foundation is based on falsehood, all that is derived from it, will also have falsehood in contained within. Therefore, in an attempt to seek answers for these dogmatic conundrums, let’s ask some questions that should by now, some 2000 years or so years later, should have answers prepared. So dead people came back to life. 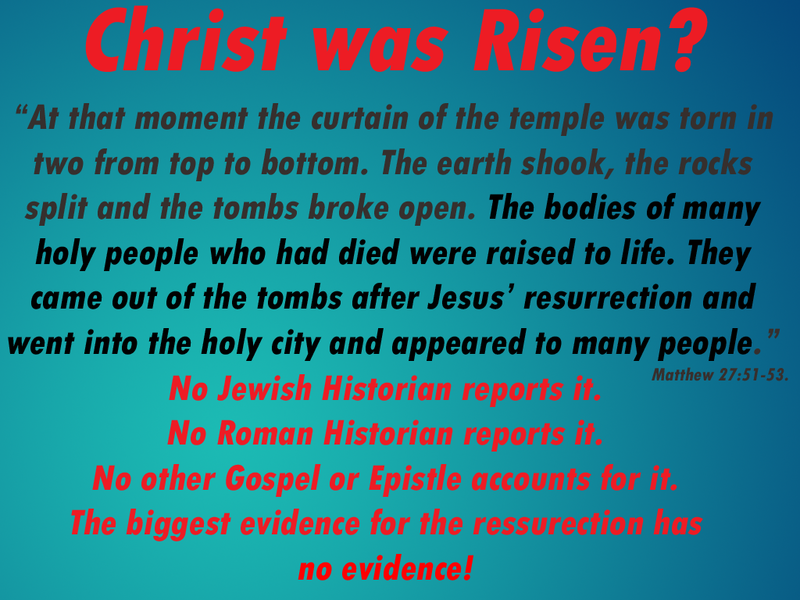 This is a miracle proving Jesus’ resurrection, this miracle is apparently witnessed by many people and yet we have some serious discrepancies here. No other Gospel of Epistles even references or mentions explicitly, what is arguably the greatest miracle one can observe, dead people returning to life. No Jewish historian or religious figure ever mentions that dead people came back to life and roamed their holiest city’s streets. Not even the Romans, the largest Empire, most powerful nation at that time, records that dead people came back to life and roamed their streets. Yet somehow, a person not from that time, 50 or so years later (33AD, Ascension, Matthew written between 75 AD – 99 AD), mentions this maybe two or three lines and then it turns into a historical fact. Call me skeptical, but I’m needing evidence here. I find it hard to believe, that dead people, came to life and no one at that time, not even heretical early Christian sects, nor Paul who documented the vast prayers, actions and beliefs of the early Church some 14 years later, remotely mentions or references it. It is difficult to account for the transaction mentioned Matthew 27:52,53. Some have thought that these two verses have been introduced into the text of Matthew from the gospel of the Nazarenes; others think that the simple meaning is this:-by the earthquake several bodies that had been buried were thrown up and exposed to view, and continued above ground till after Christ’s resurrection, and were seen by many persons in the city. Why the graves should be opened on Friday, and the bodies not be raised to life till the following Sunday, is difficult to be conceived. The place is extremely obscure. Perhaps there is someone willing to validate, verify this claim or if not, admit it really did not occur and is a fanciful dream of some scribe wanting to give the masses some alleged miracle to convert to Christianity for. Some women met an angel. They don’t worship the angel. They were afraid, yet they ran to tell the disciples. They meet Jesus who tells them to go to Galilee. Some women met a young man in white clothes and not an angel. They don’t worship the young man. They were afraid and said nothing to anyone. Never met Jesus, instead the angel tells them to go to Galilee. While they were wondering about this, suddenly two men in clothes that gleamed like lightning stood beside them. In their fright the women bowed down with their faces to the ground, but the men said to them, “Why do you look for the living among the dead? He is not here; he has risen! Remember how he told you, while he was still with you in Galilee: The Son of Man must be delivered over to the hands of sinners, be crucified and on the third day be raised again.’ ” Then they remembered his words. When they came back from the tomb, they told all these things to the Eleven and to all the others. Some women did not meet an angel, nor a young man, but instead two men in clothes as bright as lightning. Instead of not worshipping the angel or a young man, they worship two men. They were afraid, but instead of telling no one, they told everyone. Never met Jesus, but instead two men tell them to go to Galilee. One woman, Mary, did not meet an angel or a young man or two men but instead two angels. She did not worship the two angels. She told everyone what she saw, in contrast to the other Gospels. Met Jesus who does not tell her to go to Galilee. Jesus does not meet them at Galilee but at a house in/ near Jerusalem. Some like to say that we’ve misunderstood their scripture, some say we’ve distorted and manipulated the truth, but all we’ve really done is read the Gospels, as they are laid out. Anyone can pick up a Bible and read these contradicting narratives. In fact, I’ve linked all the relevant chapters to a popular Christian Bible website and I do hope that anyone who comes across this article, tries to investigate it for themselves. this article is so true. if Christians are right then they need to show evidence for these contradictions.